P.S. I was delighted to contribute to a fun lifestyle and design blog – on the subject of St. Barth, of course. Take a look. I think you’ll enjoy it. Located near the quaint fishing village of Corossol, the charming two bedroom Villa Beauvoir boasts lovely views and glorious sunsets. Guests are treated to a panorama of the hillside and beyond to the brilliant blue sea, where sailboats gracefully ply the waters dotted with the neighboring islands Saba, St. Eustache and St. Kitts. The comfortable living room opens to a spacious, sunny pool deck that runs the length of the house. A covered section of the deck is furnished for outdoor living and dining, and a well-equipped kitchen includes an island with seating. The two en suite bedrooms (king beds) are located on either side of the villa; one, slightly smaller, has its own terrace. 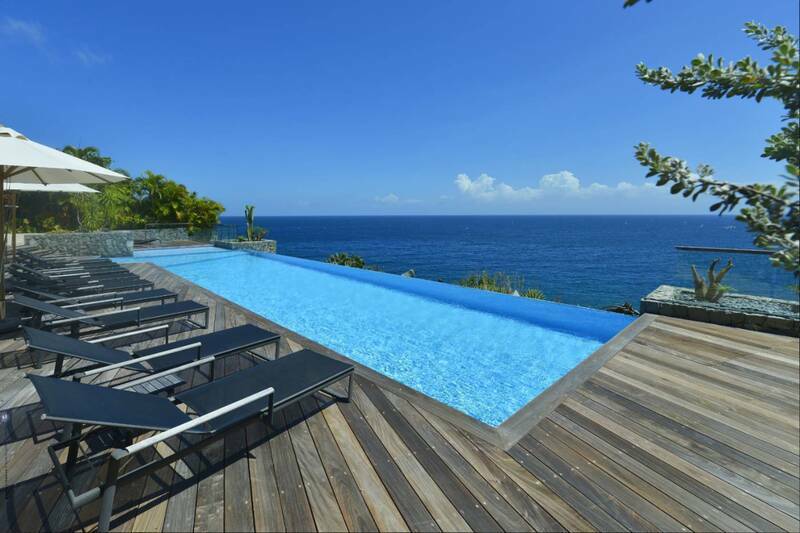 Stunning, contemporary and luxurious, the six bedroom Villa Galaxie is poised above the quieter side of Gustavia and boasts a breathtaking seascape and fiery sunsets. A terrace with a gorgeous infinity pool provides a focal point and is configured to include spacious living and dining areas. Sleeping accommodations include a master (French king) suite housed in a private pavilion. The other five lovely bedrooms, all with en suite baths, are located in an adjacent pavilion. Two connect via baths, making it ideal for families with younger children. The villa’s chic décor is ultra-modern with a white palette, and techno amenities include a surround sound music system. There is ample private parking, and Gustavia’s shops, restaurants and Shell Beach are just a short walk away. This is an exceptional vacation home and ideal for an extended family, and is the perfect venue to host a celebration. See the villas participating in the relaunch of our popular Drive, Dine & Relax Value Season Package. Its features include a week’s car rental and a dinner prepared and served by a private chef. And for those who have been asking, yes, Villa Rocamadour is again one of the villas. For new bookings from May 10 to July 10, 2016 (minimum 7-night stay), you have your choice of a 20% discount plus an in-villa dinner prepared by a personal chef, or a 30% discount. From June 1 to 30, 2016, two 1-hour massages are offered per bedroom booked for any 6-night minimum rental. Receive a 10% discount on a 5-night minimum reservation. Stay 7 nights or more and enjoy a 15% discount and one or more rental cars depending on how many of the villa’s six bedrooms you book. This offer is for new bookings and based on availability from May 5 to December 14, 2016. Attention fashionistas: The island’s annual sales Les Soldes will continue until June 17, 2016. Two of our beloved longtime island staff members, Ted Deltour and Mai Vu thi Nu, are leaving us to pursue their dreams and new vocations. We are pleased to welcome Anne Laure Amy to the island team. We’re sure you’ll be pleased as well to work with her. Read all about it in Peg’s Blog. We are pleased to announce that our island office Gérant (General Manager) and sailing guru, Benoit Meesemaecker, and his team won Les Voiles de St. Barth in their class racing on their Island Water World Melges 24 sailing boat. Congratulations, Benoit! The gorgeous Christopher offers two opportunities to eat, drink and be merry. Sunday evenings they do BBQ at their feet-in-the-sand poolside restaurant Mango. Fresh local lobsters and premium cuts of meat will be on the grill – all to be enjoyed with live music (through August 21). Tuesday evening is Gypset Night at the sophisticated Taïno restaurant. A sushi buffet is complemented by grilled lobsters and prime rib. Music will be by the divine duo of island favorites Soley and Christian (through August 23). Our concierge team would be pleased to book you a table for either evening – or both! We are pleased to list several brand-new contemporary apartments located in a small grouping of semi-detached townhouses called the Solandra complex. Most face northwest, while A1 and A2 face northeast. All are just a short walk from popular Lorient Beach. This prime locale places the owner in proximity to all the village has to offer: bakeries, grocery shopping, casual dining and more. In each apartment, an open floor plan encompasses a compact kitchen with island seating; a laundry room and a guest bath are conveniently adjacent. The living room opens via glass sliders to a covered dining terrace and a private garden-like yard with enough room to add a Jacuzzi or a plunge pool. A striking banistered staircase leads to a small landing with an en suite bedroom on either end, one with a balcony. Two parking spaces in front of the villa are included. Hurry! Only five are still available for purchase. Everything about the trip was great. We are looking forward to returning. 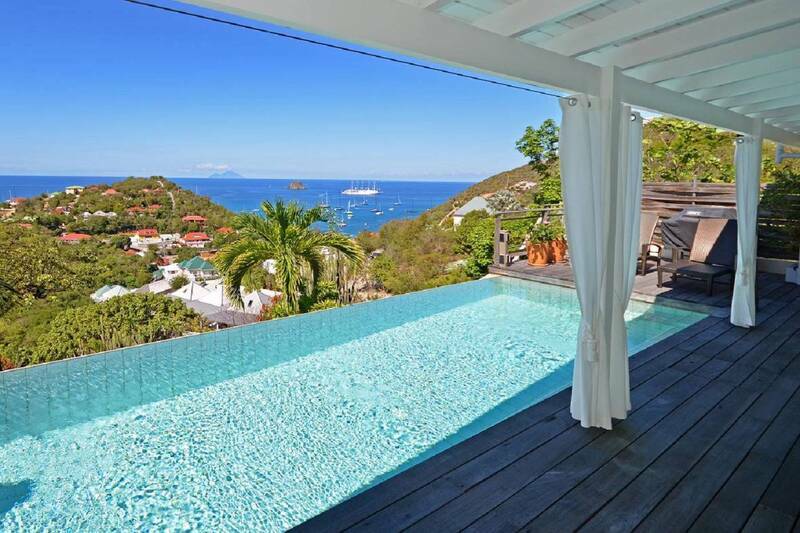 This was our second time on the island and our first renting a villa, so we're still learning about staying in St. Barths. We enjoyed walking to Colombier from our villa via the trail by Flamands, and I was pleasantly surprised by the ease and cost of renting a surfboard from Hookipa in St. Jean (it's about 35 euros for a 24-hour rental, which includes pads and straps for the car, a board bag, and wax). We enjoyed the restaurants and getting pizza from L'Isoletta and taking it back to our villa. Thanks again for all of your assistance. Your help and that of the on-island staff was much appreciated; everyone was courteous and very professional.